In 552 AD, Yaquis were living in family groups along the Yaqui River (Yoem Vatwe) north to the Gila River, where they gathered wild desert foods, hunted game and cultivated corn, beans, and squash. Yaquis traded native foods, furs, shells, salt, and other goods with many indigenous groups of central North America. Among these groups are the Shoshone, the Comanche, the Pueblos, the Pimas, the Aztecs, and the Toltec. Yaquis roamed extensively in pre-Columbian times and sometimes settled among other native groups like the Zunis. After contact with non-Natives, the Yaquis came into an almost constant 400 year conflict with Spanish colonists and the later Mexican republic, a period known as the Yaqui Wars, which ended in 1929. The wars drove many Yaquis north from Mexico and into Arizona. 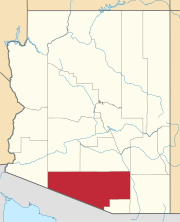 This image shows the location of the Pascua Yaqui Reservation in Pima County, Arizona. In 1964, Congressman Morris K. Udall introduced a bill in Congress for the transfer to the Tribe of 202 acres (0.82 km2) southwest of Tucson. The bill was approved in August 1964 and the Pascua Yaqui Association, a nonprofit Arizona corporation, was formed to receive the deed for the land from the federal government. In early 1977, Mr. Raymond Yberra and Mr. Anselmo Valencia, representing the Pascua Yaqui Association, met with US Senator Dennis DeConcini (D -AZ) to urge him to introduce legislation to provide complete Federal Recognition of the Yaqui people living on the property conveyed to the Pascua Yaqui Association by the United States through the Act of October 8, 1964. (78 Stat. 1197). Senator DeConcini introduced S.1633 on June 7, 1977. After extensive hearings and consideration, it was passed by the senate on April 5, 1978. It was accepted by the Conference Committee with the House of Representatives and the Conference Report was passed by the Senate. It became public law, PL 95-375, on September 18, 1978.The law provides for all federal services and benefits including those provided by the Bureau of Indian Affairs and the Indian Health Service. It gives the tribe powers of self-government, with Reservation status for Yaqui lands. The Pascua Yaqui Tribe of Arizona received designation as a historical tribe in 1994. In 1988 the Tribe's first constitution was approved. 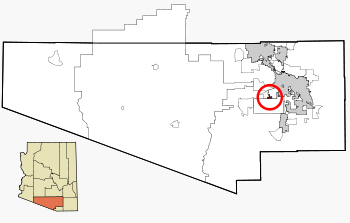 The Pascua Pueblo Yaqui Reservation (32°06′56″N 10°04′48″W﻿ / ﻿32.11556°N 10.08000°W﻿ / 32.11556; -10.08000) is located in Pima County, in the southwestern part of the Tucson metropolitan area, amidst the suburban communities of Drexel Heights and Valencia West, and adjacent to the eastern section of the Tohono O'odham Indian Reservation, known as the San Xavier Indian Reservation. It has a land area of 4.832 km² (1.8657 sq mi, or 1,194 acres), and a 2000 census resident population of 3,315 persons, over 90 percent of whom are Native Americans. The community is governed by a chairman, a vice chairman and nine tribal council members. Police protection is provided by the Tribal Police Department, and fire protection is provided by six full-time firefighters and four reserves. Though now based in Christian teachings, dominantly Catholicism, the culture of the Pascua Yaqui has remained rich in native Indian elements. The Tribe has accepted political integration into American society, but has retained their former religious and cultural way of life. The Yaqui people have used oral traditions to pass their history from one generation to the next. The Tribal government is the largest employer on the reservation. In addition to a smoke shop and artisan shop, the Tribe operates the Casino of the Sun gaming facility, which includes slot machines, bingo, restaurants, games and employs more than 600 staff. Casino Del Sol, the Tribe's second gaming property, opened October 2001 and has provided an additional 550+ jobs on the reservation and in the Tucson Community. The expansion of Casino Del Sol opened November 11, 2011. An additional 700 jobs was provided to the community with the expansion. A tribal council is made up of eleven elected officials, dedicated to the well being and advancement of their tribe as a whole. Peter Yucupicio	Chairman, Catalina Alvarez	Vice Chairwoman, Francisco Munoz	Treasurer, John Escalante	Council Member, Marcelino Flores	Council Member, Robert Valencia	Council Member, Raymond Buelna	Council Member, David Ramirez	Council Member, Mary Jane Buenamea	Council Member, Rosa Soto Alvarez	Council Member, Cruzita Armenta	Council Member. The Pascua Yaquis have a status similar to other Native American tribes of the United States. This status makes the Yaqui eligible for specific services due to trust responsibility that the United States offers Native American peoples who have suffered land loss. A U.S. government assisted news letter, Yaqui Times, also helps in keeping the people of the Pascua Yaqui Tribe informed. The Pascua Yaqui Tribe operates a Judicial Department with both trial courts and an appellate court. Criminal cases are prosecuted by a Prosecutor's Office. Representation for indigent individuals is available through the Public Defender's Office. The Tribe is represented by the Attorney General's Office. All of these functions and a tribal police department are located in a modern Multi-Purpose Justice Center, which was opened in 2012. Since the Supreme Court's majority opinion in Oliphant v. Suquamish Indian Tribe, the tribal courts were prevented to trial a non-Indian person, unless specifically authorized by the Congress. This body allowed the right for the tribal courts to consider a lawsuit where a non-Indian man commits domestic violence towards a Native American woman on the territory of a Native American Tribe, through the passage of Violence Against Women Reauthorization Act of 2013 (VAWA 2013) signed into law on March 7, 2013 by President Barack Obama. This was motivated by the high percentage of Native American women being assaulted by non-Indian men, feeling immune by the lack of jurisdiction of Tribal Courts upon them. This new law generally takes effect on March 7, 2015, but also authorizes a voluntary "Pilot Project" to allow certain tribes to begin exercising special jurisdiction sooner. On February 6, 2014, three tribes were selected for this Pilot Project: the Pascua Yaqui Tribe (Arizona), the Tulalip Tribes of Washington, and the Confederated Tribes of the Umatilla Indian Reservation (Oregon). Marcos A. Moreno, (Yaqui/Mixed), The first tribal member from the Pascua reservation to attend an Ivy League institution. Pilar Thomas, lawyer and former government official. ^ "Pascua Yaqui Tribe - ITCA". itcaonline.com. Retrieved 18 April 2018. ^ "Casino Del Sol - Tucson's Premiere Luxury Resort & Casino". Casino Del Sol. Retrieved 18 April 2018. ^ User, Super. "Pascua Yaqui Tribe". www.pascuayaqui-nsn.gov. Retrieved 18 April 2018. ^ Department of Justice, "Justice Department Announces Three Tribes to Implement Special Domestic Violence Criminal Jurisdiction Under VAWA 2013"
^ Horwitz, Sari (18 April 2014). "Arizona tribe set to prosecute first non-Indian under a new law". Retrieved 18 April 2018 – via www.washingtonpost.com. ^ "Mario Martinez: Contemporary Native Painting - Press". www.mmartinezpainting.com. Retrieved 18 April 2018. ^ "Marcos Moreno Pascua Yaqui Tribe". Retrieved 17 April 2016. This page was last edited on 19 January 2019, at 15:08 (UTC).